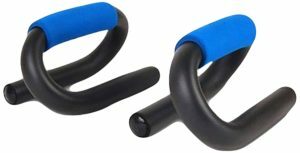 Amazon is here with a great deal offering StarX S-Pushup Stainless-Steel Push-up Bar, Set of 2 (Black) at Rs 264 only . Push up bar is made with stainless steel and gripped with extra soft form, for comfortable feel and push up is non slip, you can use it anywhere. Grab it Now.! How to Buy StarX S-Pushup Stainless-Steel Push-up Bar, Set of 2 (Black) at Rs 264 only?